Human perception plays an important role in identifying whether it is noise or sound that we hear. Our ears are always listening and cannot be turned off. Our subconscious mind will constantly evaluate whether a sound is known or unknown, whether it is pleasant or annoying, or whether it represents a danger. If a danger is recognised, we will immediately be in an alert state and ready to run or defend. Sound is defined as what you as a person can hear; noise is defined as unwanted sound, even at normal or low intensity levels. ​Figure 4.1.1 Noise or sound? What we in one situation describe as noise (e.g. music in the room next to bedroom) can in other situation be perceived as sound. It is important to have a good acoustic environment for the specific activity taking place, e.g. sleeping, watching TV, talking. What we describe as noise in one situation can be perceived as sound in another. Birdsong in the early hours of the morning, for example, can be perceived as noise and disturb sleep quality. Traffic in the city can have a negative influence and be evaluated as noise, but in other situations it can be perceived as sound; it can make you feel in contact with the surroundings and nature, and allow you to feel included in the community. 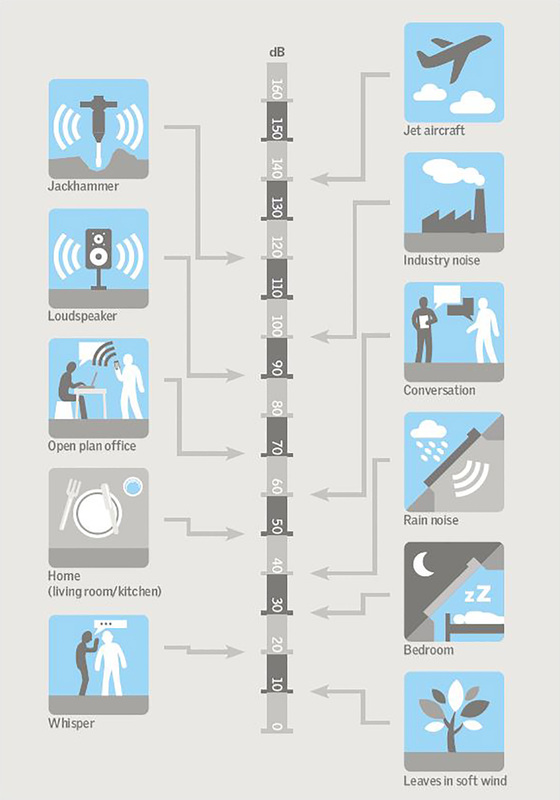 Noise can have a significant impact on the health and performance of building occupants. Stress, headache and learning difficulties can all be caused by noise. Sleeping problems and lack of rest can also be caused by noise (National Institute of Occupational Health in Denmark, 2006). Result in extra sick leave. It is known that noise can cause premature death. In 2003, it is believed to have been instrumental in the deaths of an estimated 200-500 people in Denmark (Danish Ministry of Environment, 2003). ​Figure 4.1.2 The complexity of acoustics environment in buildings. Noise can cause stress, headache and learning problems. The physical description of sound is vibrations (longitudinal waves) of the air with a frequency (in Hz) that people can hear. Decibel (dB) is the unit used to measure sound level; it is a logarithmic unit that describes a ratio. Sometimes you see decibel written as dB(A) instead of decibel in dB. The (A) means the sound measured is a total sound level (consisting of many individual frequencies) that is “A-weighted” and thereby corresponds to human subjective perception of sound. In the figure below, typical sound levels and sound pressure levels (CEN, 2007; WHO, 2009; SBI, 2014b) are given. 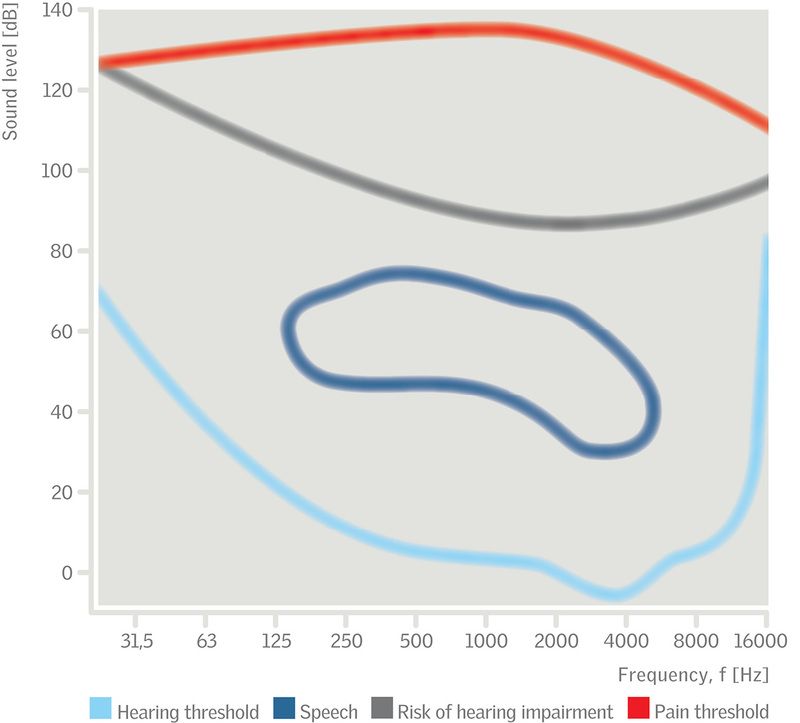 ​Figure 4.1.3 Sound pressure levels for speech and threshold levels. ​Figure 4.1.4 Typical sound levels. Danish Ministry of Environment (2003) Den danske vejstøjstrategi.http://mst.dk/borger/stoej/hvad-er-stoej/ (accessed: 2014-09-19). National Institute of Occupational Health in Denmark (2006) Støj fra menneskelig aktivitet - Et udredningsarbejde. WHO (2009) Night Noise Guidelines for Europe. http://www.euro.who.int/en/health-topics/environment-and-health/noise/publications/2009/night-noiseguidelines-for-europe (accessed: 2014-09-19).